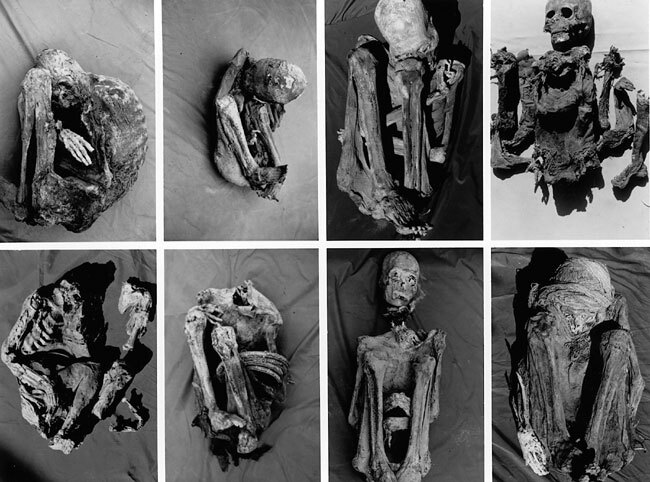 Eight naturally mummified bodies from a low valley archaeological site (Az-75) near the modern port city of Arica in extreme northern Chile were studied. They represent part of the prehistoric cultural phase locally called "Alto Ramirez", that followed the Chinchorro culture in the coastal area of northern Chile between about 1000 B.C. to A.D. 500. Radiocarbon results from this sample dates this group between 350 B.C.-A.D. 500. Anatomic findings in six bodies indicate evidence of lobar pneumonia from which they had recovered, while in two bodies pneumonia was the cause of death. Their agricultural occupation and the naturally dusty condition of the air in this desert región contributed to the development of silicate pneumoconiosis. Chemical reconstruction of their diet revealed that, in contrast to their marine subsistence predecessors (Chinchorros), the Alto Ramirez people relied substantially on agropastoral subsistence strategies. However, exploitation of the conveniently available marine resources constituted about one-third of their diet. Fish tapeworm infection (Diphyllobothrium pacificum), so commonly found among the Chinchorros, was absent in these bodies, suggesting they cooked their fish. If this sample is characteristic of their entire population, the introduction of agropastoralism to this coastal area was accompanied by a high level of pulmonary infections. We have initiated study of a much larger sample of mummies from all northern Chile prehistoric populations to determine whether differences in pneumonia frequency exist in these groups. Key Words: Pneumonia, silicate pneumoconiosis, Alto Ramirez, diet, mummies, paleopathology. Se presentan los resultados del estudio de ocho cuerpos momificados en forma natural, del sitio arqueológico Az-75 ubicado en la parte baja del valle de Azapa en las cercanías de la moderna ciudad-puerto de Arica, extremo norte de Chile. Estos cuerpos pertenecen a la fase cultural conocida localmente como "Alto Ramírez" y sucede a la población Chinchorro, antiguos habitantes en la costa del norte de Chile, a partir de aproximadamente los 1000 a.C. hasta 500 d.C. Resultados radiocarbónicos ubican a esta muestra entre 350 a.C. a 500 d.C. Rasgos anatómicos micro y macroscópicos encontrados en los ocho cuerpos indican la evidencia de neumonía lobular que pudo complicar la salud de estos individuos o causarles la muerte. Polvo en suspensión en el aire por efecto del trabajo agrícola y la condición natural del aire en esta zona desértica con alto contenido de partículas en suspensión contribuyeron al desarrollo de la neumoconiosis silicosa. La reconstrucción de la dieta reveló que, en contraste a sus predecesores costeros (Chinchorros), la gente de Alto Ramírez dependía sustancialmente de estrategias de subsistencia agropastoriles. Sin embargo, la explotación de los abundantes y permanentes recursos marítimos constituyeron un tercio de su dieta. La ausencia de infección intestinal por lombrices transmitida a través del consumo de carne de pescado crudo, comúnmente encontrado entre los Chinchorros, sugiere que el pescado se comía cocinado. Si esta muestra caracteriza a la población en su totalidad, el desarrollo de la economía agropastoril en el área costera se caracteriza por un alta incidencia de infecciones pulmonares. Un estudio más amplio de esta población y su precedente Chinchorro, se requiere para evaluar esta observación. Palabras Claves: Neumonía, pneumoconiosis sílica, Alto Ramírez, dieta, momias, paleopatología. This report documents the results of bioanthropological studies on eight spontaneously (naturally) mummified bodies of an agropastoral people (Alto Ramirez) that settled in the low Azapa valley near the coast of northern Chile. The Azapa valley of northern Chile is located at about 18º south latitude; the port city of Arica lies at its mouth. The Atacama desert, among the world's most arid, lies between the Pacific coast and the Andean peaks of more than 6000 meters altitude. The Azapa is one of numerous east-west oriented valleys traversing the desert, draining the Andes' highlands. These valleys' coastal plain segment contains sufficient sediment to have enabled irrigation agriculture since antiquity. This portion of South America's western coast was initially settled by an archaic population, the Chinchorro people, about 7500 B.C. and who practiced an almost exclusively maritime subsistence. These coastal sea hunters were separated from their highland neighbors by less than 100 horizontal kilometers of the Atacama desert and 4000 meters of altitude. About 1000 B.C. a population (locally called Alto Ramírez people) settled in the low valleys after which the Chinchorros are no longer recognizable archaeologically. Evolution of the highlands' Tiwanaku civilization eventually expressed itself in the lower Azapa valley at least by about A.D. 350, locally termed the Cabuza tradition. Archaeological features of the tombs and burials from the Az-75 site are consistent with Alto Ramírez and Tiwanaku populations. Originally thought to be migrants from the highlands, recent evidence suggests that the changes in subsistence strategy and material goods indicate a highland influence but that most of the bodies excavated and studied from the low valley cemeteries represent a continuing coastal population (Goldstein 1995/1996). Regional development that followed the Tiwanaku empire's collapse about A.D. 1000 included a succession of local cultures (Regional Development Period) (Maitas Chiribaya, San Miguel, Gentilar and finally Inca) leading up to the Spanish conquest (Rivera 1991). 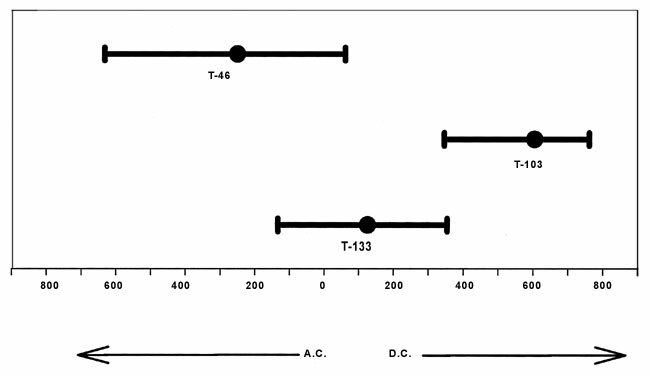 Of 64 mummified bodies excavated from the Az-75 site in 1982, eight spontaneously mummified bodies (Figure 1) were dissected in 1989 and tissue analyzed subsequently from the following tombs: T-43, 46, 57, 85 C-1, 85 C-2, 103, 131 and 133. Their demographic features are listed in Table 1. This site is located in the lower Azapa valley about 20 km from the sea. Excavations were performed under the direction of the late Guillermo Focacci from the Departamento de Arqueología at the Universidad de Tarapaca in Arica, Chile. These tombs were from a level below that occupied by the Maitas Chiribaya burials from the multicultural burial area of San Lorenzo in the Azapa Valley of northern Chile (Az-75). 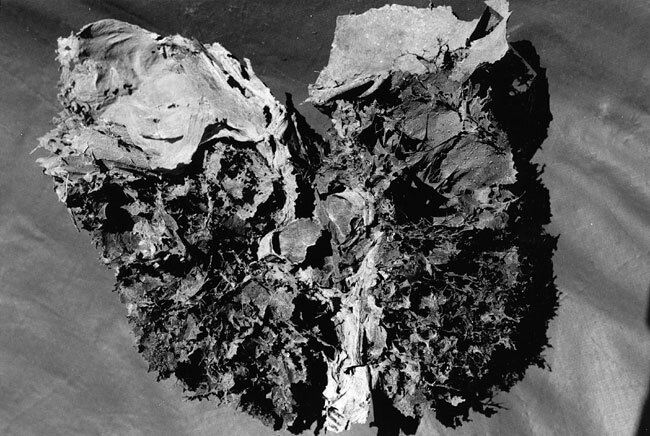 Figure 1.The bodies of the eight studied mummies of this report, from burial site Az-75 in the Azapa Valley. Their tomb numbers are: upper row (left to right) T-43, 46, 57, 85C1; lower row: T-85C2, 103, 131, 133. Cuerpos de las ocho momias estudiadas, del cementerio Az-75 del valle de Azapa. Los números de tumba son los siguientes: En la fila superior (de izquierda a derecha) T-43, 46, 57, 85C1, en la fila inferior T-85C2, 103, 131, 133. These were carried out at the Museo Arqueológico de San Miguel of the Universidad de Tarapaca. Simple flat plates of the chest, abdomen and, in a few, the skull were prepared and the films developed manually. Computerized tomography technology was not available. Following external examination, measurements, radiology and photography, anatomic dissection was carried out. Disarticulation of the extremities permitted access to the thoracic and abdominal cavities by removal of the ventral skin and rib cage. The principal organs were identified in situ, then removed and dissected in detail. The head was separated from the trunk and all soft tissue structures on the entire body were dissected Appropriate soft tissue samples were selected from all preserved organs for possible further study. Preservation scores. Terms such as "poorly-preserved" do not transmit precise information. We have created and used the following measures that can be carried out in about one minute in the field. While lacking ultimate precision, these indices meet the need for a rapid evaluation of bone soft tissue and visceral organ preservation. Bone preservation (BP): up to five points are assigned for each of the following body segments: head, chest, abdomen, arms, legs after which the sum of these is multiplied by four and expressed as a % value. For example, for a body whose right arm and head were missing, the five components noted above would be scored 0+5+5+2.5+5 = 17.5 x 4 = 70. The same system is applied for an estimate of the body surface area covered by skin (STP: soft tissue preservation). The "soft tissue index" (STI) is then determined by dividing the soft tissue preservation % (STP) by the bone preservation value and multiplying by 100. The BP and STP values provide an estimate of the degree of preservation of the skeletal and soft tissue components of the body. The STI expresses these as a ratio indicating the degree of soft tissue preservation in terms of the fraction of preserved skeleton. Finally an estimate of body organ preservation score (OPS) is made by assigning to each of the following organs up to 10 points each and summing the total: eyes, external genitalia, heart, lungs, liver, spleen, kidneys, bowel, brain and hair. Microscopic studies. Rehydration of small samples in Sandison's (1955) modification of Ruffer's solution (Ruffer 1921; Zimmerman 1972) was followed by fixation in 4% formalin. Subse quent dehydration, paraffin embedding and microtome sectioning and staining followed the usual hospital surgical tissue processing methods. Coprolites (dried feces) were prepared as described by Reinhard et al. (1988). They were examined histologically by Patrick Horne, Dept. of Histology, York County Hospital, Newmarket, Ontario. Three samples were acquired under aseptic conditions from untouched, skin-covered muscle or liver, wrapped in sterile sheet aluminum and processed at Geochron Laboratories, Cambridge, Massachusetts, U.S.A. Samples of bone for stable isotope ratios of carbon and nitrogen were obtained from the mid-diaphysis of the tibia or femur. A recent review of the principles of measurement and interpretation is available in Ambrose et al. (1997). The analyses of these were carried out in the laboratory at Augustana College, Dept. of Biology under the direction of Drs. Larry Tieszen and Michael Chapman. Their interpretation as recorded here is by the authors of this publication. The radiocarbon dates for the three sampled bodies are listed in Table 1 and illustrated in Figure 2. These span an interval (c. 350 B.C. _ A.D. 500) characterized by the initiation and development of agropastoralism in northern Chile's low valleys. Table 1. Radiocarbon values on studied mummies. Fechas radiocarbónicas de los individuos estudiados. a The radiocarbon tests were performed by Geochron Laboratories in Cambridge, Massachusetts, U.S.A. Tissues tested were liver (T-46, T-103) and muscle (T-133). b The 13C-corrected radiocarbon values were translated into calendrical years using the University of Washington Quaternary Isotope Laboratory Radiocarbon Calibration Program Rev. 3,03C, Test Nº 10 as issued and described by M. Stuiver and P.J. Reimer in Radiocarbon 35:215-230, 1993. The results are presented here with ± two standard deviations (S.D. ), and listed both as BP (Before Present; i.e., before A.D. 1950) and as B.C. or A.D. for the reader's convenience. 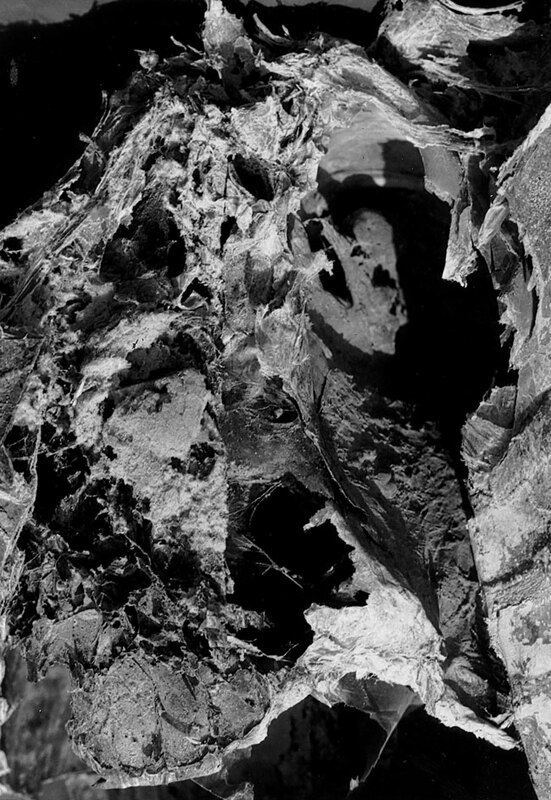 a Los análisis radiocarbónicos se realizaron en el Laboratorio Geochron en Cambridge, Massachusetts, U.S.A. Los tejidos blandos analizados corresponden a fragmentos de hígado (T-46, T-103) y músculo (T-133). b Los valores corregidos de 13C fueron transformados en años calendáricos a través del Programa de Calibración de la University of Washington Quaternary Isotope Laboratory, Rev. 3.03C, Test Nº 10 descrito y publicado por M. Stuiver y P.J. Reimer en Radiocarbon 35:215-230, 1993. Los resultados se presentan con dos desviaciones estándar ± y se listan en años antes del presente (a.P.) y años antes de Cristo (a.C.), para conveniencia del lector. Figure 2. Calibrated dates of radiocarbon tests. Central point is the reported date (after calibration) and range represents + or - two standard deviations. A.C.= Antes de Cristo (before Christ); D.C.= Después de Cristo (After Christ). For further details see legend in Table 1. Fechas calibradas de las muestras radiocarbónicas analizadas. El punto central es la fecha reportada (después de la calibración) el rango representa dos errores estándar. The chest x-rays of T-131 and T-133 were abnormal. That of T-131 reveals a very distinct, clearly-defined area of radiolucency in the right upper thoracic area surrounded by an irregular zone of density (Figure 3a). This correlates with the gross observation of an empyema (abscess of the pleural cavity) of the right upper thoracic cavity found at time of dissection (Figure 3b). The chest x-rays of T-133 also revealed considerable change in the right upper thoracic area. In this body the x-ray demon strated nearly complete opacification of the medial half of this area. This was the result of sand-filled major bronchi as described below. The more peripheral densities reflected consolidated lung surrounding an empyema found at dissection. Figure 3. Right chest X-ray and dissected relevant lung area of mummy T-131. (a) The chest X-ray reveals irregular, radiodense areas surrounding a central radiolucent space (arrow). (b) Photograph of the corresponding part of the upper right chest interior reveals that the radiodensities are fibrous walls of a central area partly filled with powdery exudate-empyema (arrow). Radiografía de tórax, lado derecho y disección de un área del pulmón del individuo de la T-131. (a) La radiografía de tórax muestra áreas irregulares radioopacas rodeando un espacio central radiolucido (flecha). (b) La fotografía de la parte correspondiente a la zona torácica interior superior derecha revela que las zonas radioopacas son paredes fibrosas de un área central parcialmente rellena con fluidos exudados del empiema. Skeletal tissue preservation is high (mean ~93%) while the soft tissue preservation score for the groups as a whole is about 77%; the resulting soft tissue index is about 83%, indicating that 83% of the preserved skeleton is covered by soft tissue. Individual organ preservation scores vary from 12 (spleen and kidneys) to 86 (lungs). Collectively the mean organ preservation score is 49% (Table 2). Lung pathology. Each of the eight bodies examined revealed some type of lung pathology (Table 3). Old pleural adhesions were present, usually with a lobar distribution in all eight bodies. In addition, T-131 demonstrated a mediastinal shift to the right, with consolidation of the right upper and middle lobes. In the center of this consolidated mass was an empty space about 5-6 cm in diameter bounded medially, superiorly and inferiorly by consolidated lung and laterally by the chest wall. This empty space is lined by lighter brown, granular, friable, loose tissue. The right main bronchus is sharply angulated to the right but is without internal obstruction. The appearance is that of a chronic empyema of the right upper thoracic cavity (Figure 3b). The above description is very similar to the pathology of the lung in T-133. In this case the features of a mediastinal shift, sharply angulated right bronchus, consolidated right upper lobe with a clear central area bounded laterally by the chest wall that is filled with granular debris also reflect an empyema. Materials and Methods in this articles text for derivation of preservation indices. Demografía y estado de conservación de los cuerpos estudiados. Ver texto sobre derivaciones de los índices de conservación. Table 3. Pathology findings in studied mummies. Patologías encontradas en los cuerpos estudiados. Histological studies reveal extensive fibrosis replacing much of the lung architecture in the areas involving the empyema, suggesting a chronic process. The grossly uninvolved lung on the left side reveals diffuse fibrosis microscopically in many areas, throughout which a fine refractile granularity suggests silicate pneumoconiosis. Other lung pathology included T-57 in which both lungs were diffusely expanded without localized pathology but in which pulmonary adhesions were present in only one area. These findings suggest diffuse pulmonary emphysema (Figure 4). This impression is supported grossly by the presence of a "barrel chest" deformity. Moderate cardiomegaly in this individual may reflect right ventricular hypertrophy secondary to the emphysema. Nonpulmonary pathology. Heads of two bodies, one adult (T-103) and one child (T-85, C-2), were absent. The distal half of the esophagus in T-43 is grossly dilated as is the stomach, while the esophagogastric junction is widely patent. These findings suggest the possibility of Chagas' disease. The histologic appearance of the esophageal sections demonstrate no evidence of trypanosomes, however, and the colon is not dilated. Thus the diagnosis of Chagas' disease (American trypanosomiasis) remains unconfirmed. Figure 4. Lungs of mummy T-57. 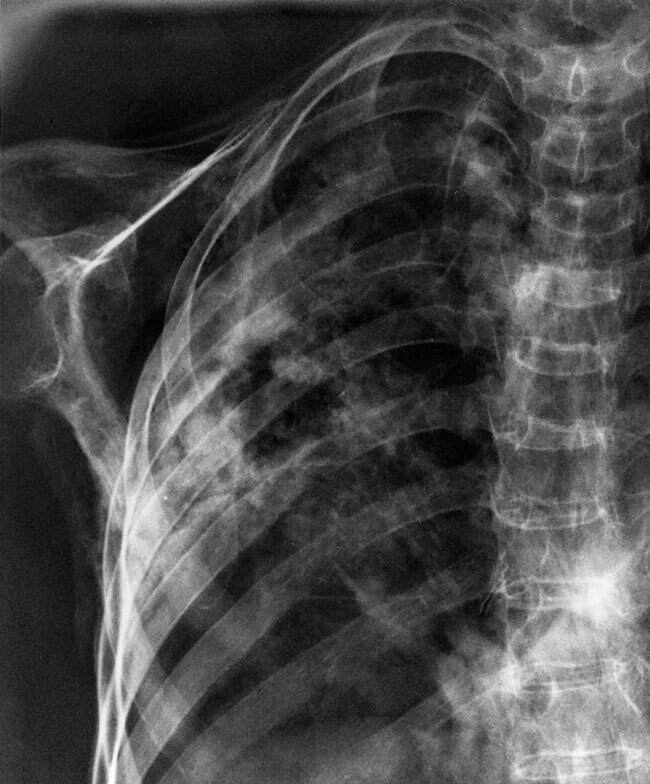 The expanded, unconsolidated state of these lungs, together with a "barrel-chest" deformity suggests that diffuse pulmonary emphysema was responsible for these changes. Pulmones del individuo T-57. El estado expandido no consolidado y la deformación torácica de barril sugiere que un enfisema pulmonar difuso produjo estos cambios morfológicos. Cranial deformation was found in all six bodies in which the head was retained (Table 3). How ever, four different forms of intentionally deformed crania were identified and classified using criteria reported by Allison et al. (1981). In two of these (types eight and 10 in T-85, C1 and T-133) flattening occurred by the use of boards in the cranial deformer, while type 9 differs from type 3 primarily by the presence of a precoronal suture depression in type 9. This difference may merely reflect the degree of tension on the cranial deformer, the precoronal depression reflecting overriding of bones at that suture. Coprolite studies revealed no ova or parasites present in any of the coprolite samples. Table 4 lists the measured values for d13C in bone collagen and bone apatite and also d15N for each individual as well as group means. Values for the children were not significantly different from mean values of adults, so the results of all eight bodies can be grouped. Table 4. Chemical values for d13C collagen, d15N collagen and d13C bone carbonate (apatite). Valores químicos de colágeno d13C, colágeno d15N y carbonato óseo d13C (apatita). The rank of collagen pseudomorph in column 2 indicates the quality of the pseudomorph, the gelatinous collagen bone protein core that is formed after mineral removal during collagen extraction. Pseudomorph is based on a scale of one to five, five being the highest quality, one being the lowest. The criteria for acceptable bone samples include the following: Pseudomorph > one, % Yield >3.0, % C >5%, C:N between 2,9 and 3,6%. The two samples marked with an asterisk are duplicate samples analyzed for quality control purposes. El rango indica la calidad de la seudoforma, correspondiente a la sustancia gelatinosa de la proteína del colágeno óseo, lo que se forma luego de remover las sustancias minerales, durante la extracción del colágeno. La seudoforma se basa en una escala de uno a cinco, donde cinco es el valor de mayor calidad y uno es el valor de la calidad más baja. Los criterios para una muestra aceptable fueron los siguientes: seudoforma > uno, % de muestra producida >3,0, % C > 5%, valor de C:N entre 2,9 y 3,6%. Las dos muestras marcadas con un asterisco corresponden a análisis de control de calidad. Preservation of soft tissues was at a useful level. The soft tissue index (S.T.I.) was 83, reflecting that 83% of the preserved skeletal tissue was covered by intact skin (and, of course, its underlying muscle and other soft tissues of the extremities). In addition 49% of the visceral organs were also preserved. Much of the organ soft tissue loss occurred in the bodies of the three children. This is a common phenomenon in spontaneously mummified infants, probably due to the higher body water content of children. Fortunately most (86%) of this group's pulmonary tissues were intact, permitting detailed evaluation of this organ's changes. In each of the eight studied bodies constituting this present report, evidence (pleural adhesions) of past pneumonia episodes was found from which the individual had recovered and the lesion had healed (Table 3). In addition, two of the individuals had died of a complication of acute pneumonia: empyema-extension of the lung infection to the pleural cavity, creating a huge abscess there. An increased frequency of lung infection with the onset of agriculture and pastoralism could be due to partial immunological deficiency secondary to malnutrition and/or anemia. Allison's (1984) study did identify a significant increase in radiologically-apparent transverse ("Harris") lines of bone growth arrest in the children of ancient agropastoralists that are believed to reflect past episodes of major stress or illness. However, pneumonia is commonly preceded by an upper respiratory infection that impairs the lung's principal defense mechanism: the lung's self-cleansing mucociliary flow in the bronchi. Impairment of this upward flow of mucus secondary to acute bronchitis permits organisms in the oral cavity to migrate down to the lung and initiate pneumonia there. Smoke exposure in poorly ventilated environments is notoriously effective in suppressing the ciliary action of bronchial lining cells that are responsible for maintaining the upward flow of mucus. Respiratory infections are spread by aerolization of coughed sputum. The crowded living conditions in structured, poorly-ventilated homes of the agropastoralists and their greater population density would be expected to enhance the transfer of pulmonary pathogenic bacteria. In addition, in adults the excessive dust inhalation associated with agricultural practices can result in the lung fibrosis (pneumoconiosis) secondary to the irritation of silicate inhalation, as was demonstrated in several of our studied mummies. This can interfere not only with the bronchial mucociliary flow but also impair one of the other lung defense mechanisms: bacterial ingestion and destruction by pulmonary macrophages. While pneumonia among the Chinchorro population is part of a larger study of pre-Columbian Andean lung infections we are preparing, it can be noted here for the sake of comparison that only 21 of 37 (57%) Late Chinchorro spontaneously mummified bodies had evidence of pneumonia. If the lung pathology in this sample of eight bodies is typical of the entire Az-75 population, then it appears clear that the advantages of an agropastoral subsistence by the Chinchorros' successors were purchased at a price of serious respiratory health impairment in the Azapa Valley. Reconstruction of these people's diets by chemical methods also sheds light on their daily activities. Discussion of the theory, method and interpretation of such studies is beyond the scope of this report, and the interested reader is referred to Ambrose et al. (1997) for details. Suffice it to say that about one percent of the carbon in atmospheric carbon is "heavier" carbon, so that its ratio of "normal" carbon (12C) to its heavier isotope (13C) is about 1/100. This 13C is treated differently by various enzymes, altering this ratio during synthesis of sugars by plants as well as synthesis of body tissue compounds. The resulting differing ratios "label" major food classes. Experimental studies have shown that the isotope ratios measured in the carbonate of bone mineral can predict the average carbon isotope ratio in the whole diet, from which value the nature of the food classes composing that diet can be determined. Since absorbed amino acids are used directly to build body tissue protein, measurement of the carbon isotope ratio in collagen (bone matrix protein) can be manipulated to predict the carbon isotope ratio of the diet's protein component. Measurement of the carbon ratios in available local food resources can then be employed to identify the nature of the general food classes from that available menu that were ingested by the studied individuals and expressed in at least a semiquantitative manner. In a similar manner the ratio of stable nitrogen isotopes can employ the very high 15N/14N ratios that are present in marine meat resources in order to separate terrestrial from marine meat in the diet. These stable (i.e., not radioactive) isotope ratios are expressed as a value (+ or _) to the extent of which they differ (d, D, d or delta) from a known standard. The values obtained from measurement of d13C and d15N for seven of the bodies studied are listed in Table 4. From these, and the values for local resources determined in a previous study (Aufderheide and Allison 1995a, 1995b; Tieszen and Chapman 1995: 409-426) the following information can be derived. The mean value of their whole diet for d13C was _20.3 and that of collagen protein was _14.1 ± .62. The d15N value of collagen protein was +18.0 ± 2.2. The whole diet d13C value _20.3 suggests a mixed diet consisting of approximately 64% of non-maize terrestrial plants (including most agricultural products known to be available to these individuals, except maize). The remainder of the diet has generated a marine meat type of d13C signal (shellfish, sea lion meat and fish are the local representatives of these). However, maize also provides a d13C signal similar to that of marine meat. The d15N value can be employed to separate the maize from the marine signal. The d15N value for the Azapa Valley's terrestrial plants is d15N = +3.9 ± 2.3 while for marine fish, shellfish and sea lions in this area it is +18.4 (Tieszen and Chapman 1995). The mean collagen d15N value for the studied bodies of this report is +18.0, indicating that, after correction for trophic effect and terrestrial plant contribution, about 52% of the protein in the diet was derived from marine meat, the remainder (48%) from terrestrial meat, maize and other plants. However, a regression equation, based on experimental data reported by Ambrose et al. (1997) indicates that the d13C value of the protein dietary portion is _16.5. Since the marine source that constitutes half of this protein has a value of _12.0, then the remaining half of the protein must have a d13C value of _21.0 that was contributed by terrestrial plants and terrestrial meat. This is only 4.0 more enriched in 13C than a pure non-maize plant diet would produce. Maize (whose d13C value is _12.0) is the only plant available to this population capable of causing that shift. Quantitation indicates that maize could not have constituted more than 31% of the plant contribution and, since plants and terrestrial meat contributed only half of the dietary protein, maize only represented a maximum of 15.5% of total protein in that diet. Presently uncontrollable factors operate to make these numerical values appear to be more precise than they actually merit. The final dietary component proportions are probably most authentically expressed in narrative rather than mathematical terms. Thus, we can conclude that the majority of the total diet consumed by this population consisted of non-maize plants and terrestrial meat sources, with a minor contribution by maize and a substantial (but still less than one-third) addition of marine foods. These proportions are similar to those estimated by measurement of trace elements (principally strontium) in a much larger group of human mummies of the Alto Ramírez culture (Aufderheide and Allison 1995b; Aufderheide 1996). In those the diets were estimated both by the stable isotopic method described above as well as by trace mineral (strontium) analysis (though the method of calculating total diet values by isotopes has changed since that time). The significance of these chemical findings provide support of archaeological evidence for the radical change in dietary subsistence strategies (including agropastoralism) that occurred after about 1000 B.C. in the low valleys near the coast. In addition, they also provide some basic quantitation for the differing physical activities that were necessary to acquire these various food resources. Clearly the low valley populations established irrigated agricultural methods together with llama and alpaca pastoralism as their primary food source, but just as clearly they exploited the conveniently proximate ocean resources as a distinctly significant dietary supplement. Importantly, the range of collagen d15N values found in these eight studied mummies vary from a low of 13.6 to a high of 20.0. This is so wide that it suggests a large variation in the amount of marine meat ingestion among these individuals_great enough to at least permit speculation about the possibility of specialization of labor in agropastoralism or marine pursuits. The absence of evidence for fish tapeworm infestation is also of interest. Previous studies (Reinhard and Aufderheide 1990) had identified the ova of Diphyllobothrium pacificum fish tapeworm in coprolites (dried feces) of a significant number of the earlier, archaic maritime people_Chinchorros. Even though the eight bodies of agropastoral people we report here reflect ingestion of detectable amounts of ocean fish, their coprolites revealed no evidence of tapeworm ova. Since such infection is acquired by eating raw marine fish, it is probable that the absence of tapeworm infection in these eight studied bodies of the Alto Ramírez and Cabuza highland migrants implies these people cooked the fish thoroughly before eating it. While the archaic Chinchorros had a central firepit in their rather flimsy dwellings (Muñoz and Chacama 1982:48), no pottery has been encountered in excavations of their sites occupied prior to 2000 B.C. ; ingestion of uncooked fish probably was a more common practice among the Chinchorro population than among the group we report here. Finally, the diagnosis of Chagas' disease (American trypanosomiasis) is suggested as a possibility to explain the megaesophagus and cardiomegaly in body T-43. The organism (Trypanosoma cruzi) responsible for this disease is notoriously difficult to demonstrate histologically in rehydrated ancient tissue sections and such a successful effort has been reported only once (Fornaciari et al. 1992). No organisms were seen in the esophagus of mummy from T-43. This disease is spread by an infected reduviid bug that serves as its vector. This insect's favorite haunt is the thatched roof or wall crevices of a residence. This studied group's houses would be ideal candidates for such a milieu but proof of the diagnosis in this case must await development of more sensitive and specific diagnostic methodology to demonstrate the presence of this parasite in tissue. In summary, these eight bodies were among those that initiated and developed agropastoral subsistence practices when they settled in the low part of the Azapa Valley near its mouth where it joins the sea. They recognized the value of the nearby ocean resources and used them to provide a rich marine protein supplement to their otherwise largely carbohydrate diet of agricultural products. While maize was consumed, it was not the dominant vegetal item in their menu. If these eight bodies reflect their entire group's health status, then part of the price paid for their successful adaptation to an agropastoral subsistence that was so profoundly different from that of the previous population's coastal marine subsistence was pulmonary disease: acute, infectious pneumonia with its often fatal complications, probably consequent to the crowded housing conditions that frequently characterize sedentary populations, as well as dust-induced lung scarring secondary to agricultural techniques. Acknowledgement: The authors express their gratitude to Sonia Guillen, Ph.D. for assistance in the gross dissection of some of these mummies.